After meeting US Secretary of State John Kerry, Sushma Swaraj tells reporters that India will not support western sanctions against Russia. India has so far been able to ignore Washington's imperative to turn its back on Russia in a bid to tighten US sanctions grip after the India’s External Affairs Minister Sushma Swaraj said Thursday the nation’s policy toward Moscow remained unchanged. “There is no change in our policy. We think that foreign policy is in continuity. 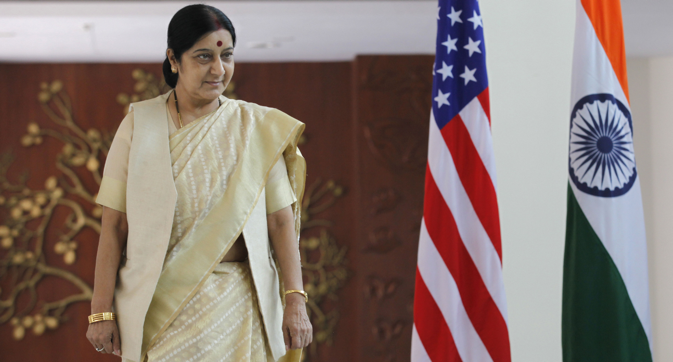 Foreign policy does not change with the change in the government,” Swaraj said in a comment on India’s relations with Russia following the deadly crash of the Malaysian airliner in eastern Ukraine. On Thursday, Swaraj met in New Delhi with US Secretary of State John Kerry who is on a mission to restore America’s crumbling ties with India in the wake of the NSA phone hacking scandal. The United States is reportedly mounting a campaign in Southeast Asia to press some of its nations into toeing US line on Russia, according to The Wall Street Journal. On Wednesday, the daily cited a senior US State Department official as saying he had met government officials in China, Singapore and South Korea this week to provide “a briefing on what we've done, answering questions and seeking support,” according to the report. “It's certainly our hope that countries in this region — which includes many significant financial and commercial centres — would join us in putting pressure [on Russia],” the senior official said. The diplomat didn’t give details of the results of the talks but noted that “good and open exchanges of views” took place. Meanwhile, a spokesperson for South Korea's Foreign Ministry told The Wall Street Journal that Seoul hasn't committed to any sanctions against Russia. The representative added the talks with US officials involved not only Russia but also other issues, including Iran. On Tuesday, the Chosun Libo newspaper reported that Peter Harrell of the US State Department arrived in Seoul in order to persuade South Korea to impose sanctions against Russia. The same day, the United States as well as the European Union announced new rounds of sanctions against Russia, once again accusing Moscow of supporting militia forces in eastern Ukraine.